The Joker, Harley Quinn, Deadshot, Captain Boomerang, and Enchantress are not the only supervillains under the supervision of Viola Davis’ Amanda Waller. The Suicide Squad movie recently added two more actors to the cast in the form of Resident Evil’s Raymond Olubowale and Clint Eastwood’s son, Scott. While the identities of the two are still unclear, a new rumor circling the web might have the answer. Well, the answer to one-half of this question. According to Latino Review’s El Mayimbe, the latest buzz is that Olubowale is playing someone hulking, someone strong, someone mutated, someone who is a bit of a shark. Know who we’re talking about? King Shark. Though the reporter states that this rumor is unconfirmed, it’s the latest spoiler-y detail to stem from the highly anticipated DC film. 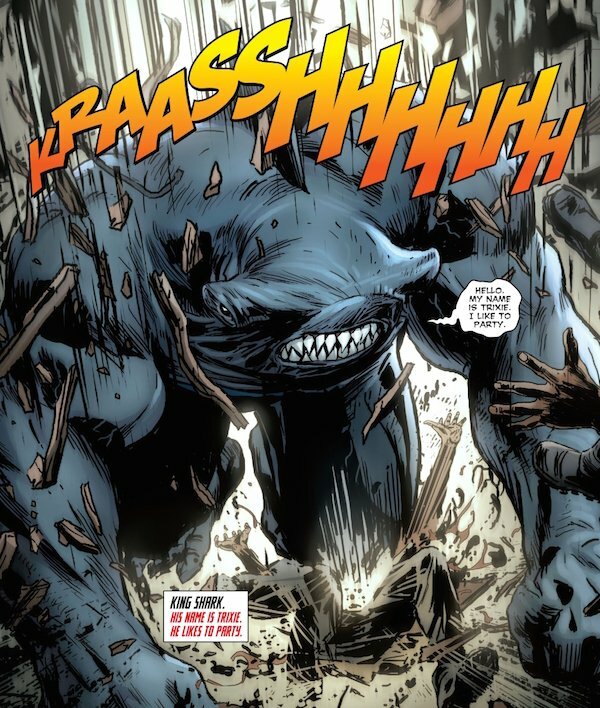 King Shark was written in the comics to be a villain for Superboy, but he eventually made his way into the Aquaman storyline. He has more recently been seen in the Suicide Squad comic arc as a hammerhead shark terrorizing Hawaii, where he was picked up by Waller and imprisoned in Belle Reve. While the five previously mentioned characters make up the main focus of Suicide Squad, King Shark could very well be seen in a cameo, should the rumor prove true. As for Eastwood’s role, it’s still unclear. However, there seems to be any number of options. If Warner Bros. decides to move ahead with a sequel, we could see more characters wreaking havoc. But first, we have to see how the first one does. Fury’s David Ayer is at the helm of Suicide Squad, while Jared Leto plays Joker, Margot Robbie plays Harley, Will Smith plays Deadshot, Jai Courteney plays Boomerang, and Cara Delevingne plays Enchantress. Elsewhere, Joel Kinnaman replaces originally cast Tom Hardy as Rick Flagg, Waller’s righthand man and the on-hand supervisor of the squad. If the other rumors are true, then we’ll also see Jesse Eisenberg’s Lex Luthor dropping in for a scuffle after he makes his debut in Batman v Superman: Dawn of Justice. The latest reports suggest he has his eye on Enchantress and the magic she wields, and Waller tasks her prisoners to go and acquire the "weapon" from his grasp. If all goes well, then Suicide Squad could be the jumping off point to expand the DC cinematic universe to an even grander extent. We will soon see the worlds of Superman, Batman, Wonder Woman, Aquaman, The Flash, Cyborg, and Green Lantern crossing over, and any number of baddies from this villain mash-up popping up.